In spite of the low temperatures in parts of the United States last month, 2018 experienced globally the third warmest April in 138 years of modern record-keeping, according to a monthly analysis of global temperatures by scientists at NASA’s Goddard Institute for Space Studies (GISS) in New York. Last month was +0.86 °C warmer than the average April of the 1951-1980 period; this value is in line with the 1.8 °C/century rate of increase of the past 40 years. Only April 2016 (+1.07 °C) and April 2017 (+0.92 °C) were warmer than the past month, and April 2010 (+0.84 °C) was only insignificantly cooler than this year’s April. The GISTEMP monthly temperature anomalies superimposed on a 1980-2015 mean seasonal cycle. View larger image or PDF. The modern global temperature record begins around 1880 because previous observations didn’t cover enough of the planet. Monthly analyses are sometimes updated when additional data becomes available, and the results are subject to change. 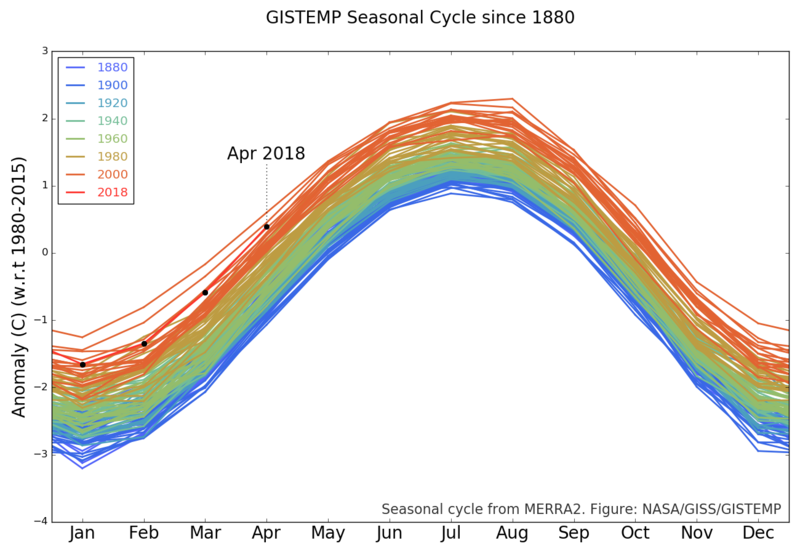 For more information on NASA GISS’s monthly temperature analysis, visit data.giss.nasa.gov/gistemp.